Above - Sketch of the Royal Muncaster Theatre, Bootle, Liverpool - From 'The Playgoer' of 1901 - Courtesy Iain Wotherspoon. 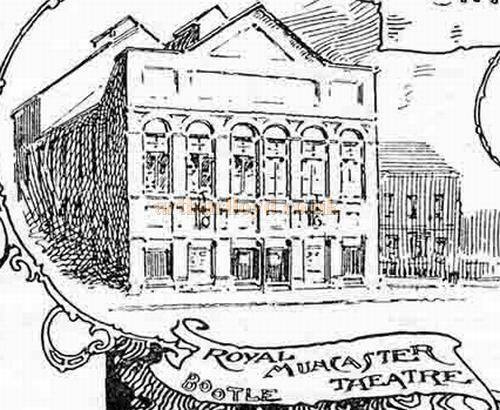 The Royal Muncaster Theatre was the first purpose built Theatre to open in Bootle. Building work began on the Theatre in 1888 and it was constructed to plans drawn up by the owner, Mr. Harry Pennington, next door to the Muncaster Hotel. Unfortunately Harry Pennington was never to see his Theatre finished as he died in August of that year and building work was suspended until his sons, John and James, took control of the project the following year. The Theatre was finally completed in 1890 and opened on the 6th of October that year under the new lease holders, H. T Denyer and Harris Fineberg who was the son of Issac Fineberg who owned the Star Music Hall at the time, now the Playhouse Theatre. The Stage of the Theatre had a depth of 25 feet and a proscenium opening of 24 foot wide by 20 foot high, and was also equipped with an iron fireproof curtain. The Theatre opened as a Variety Theatre and remained so until 1893 when the Penningtons took over the lease again and ran it as a playhouse for three weeks out of every four, and put on Variety for the forth. In 1901 the Theatre was equipped with Electric lighting to replace the original gas installation and was soon also showing the early incarnation of cinema by the American Bioscope Company. The Theatre ceased to show drama in 1911 and went back to Variety, with accompanying Films. But by 1912 Films had become the major player. The Theatre was redecorated and renamed the New Prince's Theatre and opened on the 9th of August 1912 as a Cinema with accompanying live performances. Right - The Royal Muncaster Theatre on fire in July 1964 - Courtesy KR. Due to other Cinemas in the area though the Prince's effort didn't do so well and by 1913 it was back in use as a Variety Theatre again until 1921 when George Prince took control of the building and the auditorium was completely restructured for Cinema use. This opened as the Strand Cinema on the 19th of September 1921. 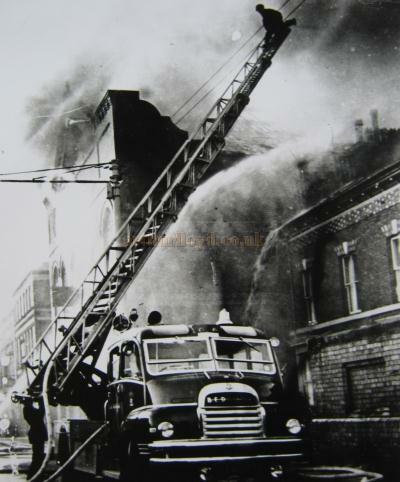 The Strand had various owners over the next 30 years but finally closed at the end of the 1940s, after which the building was used as a warehouse by Cork Industries Ltd., but was destroyed by fire on the 26th of July 1964 and demolished. Some of the information for this Theatre on this page was gleaned from Harold Ackroyd's excellent book 'The Liverpool Stage.